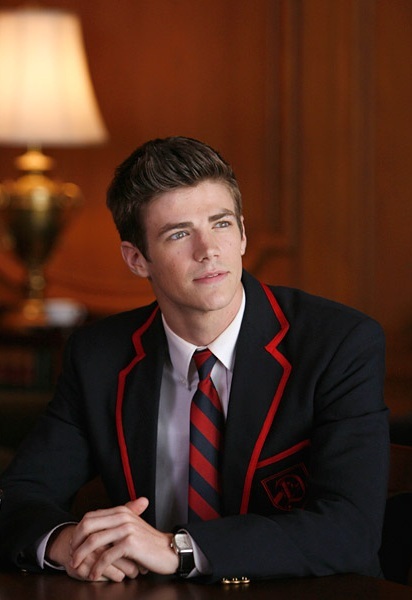 Billaboard Q&A With Grant Gustin: Sebastian is Bringing The Warblers Back! I kind of feel guilty that this is what's happening," laughs Grant Gustin, "Glee's" newest hire, on the phone from L.A. He's referring to his charmed existence over the past few years that led from his sophomore year of college to a national Broadway tour and into the arms of one of TV's most beloved shows. Until being cast as Sebastian, the new "gay villain" appearing soon on this "Glee" season, the 21-year-old had never been on a TV or film set before. On his first ever Broadway audition in New York during a college spring break he landed Baby John in the first national touring cast of "West Side Story." It would probably be wise for him to buy a lotto ticket or two with his current luck. Gustin hasn't only relied on luck, though. In addition to being at the right place at the right time, the Virginia native is a hard worker, plugging away at community and school theater in preparation for his big breaks. He put on productions of "Grease" and "That Thing You Do" at home in between playing soccer and baseball, until his mother enrolled him in an all boys Elvis tap class at the age of 8, something he pretended to hate but secretly loved. From there he was bit by the performance bug, with his first stage role in The Wiz and a long list of credits through his high school and college career. Now he's graduated to the big leagues, joining "Glee" as what's been described as the "male Santana," a villainous new character entering the scene with the intent to break up one of TVs best couples, Kurt and Blaine. He'll make his first appearance in the much-hyped Nov. 8 episode "The First Time." We snagged Gustin for his first major interview to chat about how he ended up a "Glee," what to expect from his debut and what happens when you unsuspectingly Tweet your phone number to all of "Glee" fandom. How did you end up cast on "Glee"? It's kind of random actually, I've been on tour for the past year with "West Side Story." I wasn't living here, I was all around. There's a part in the first episode, the tap dancer, and there was a group of people who tapped to Anything Goes. I auditioned for that, that's how I first got noticed. They liked me and i was going further, but I guess Ryan Murphy decided I wasn't right for that role. Which turned out fine. About a month or so later we were in Costa Mesa and Robert Ulrich wanted to meet with me. I went in and didn't know I was auditioning. I sang a song, "I'm Yours" by Jason Mraz, and from that I had a callback for Sebastian. They came in on a Saturday to meet with me because my schedule was crazy. I drove down to LA the morning before two shows to play in Costa Mesa. I had three different scenes to read with them, and I sang I'm Yours and "Crazy Little Thing Called Love" by Queen. How did you hear you got the part? After the callback two weeks went by without really hearing anything. They kept saying i was still up for it, but it had been a while and I was starting to lose hope. It was fine, I was on tour and busy. In the middle of a show on a Thursday night in Arizona I got a voicemail from my manager saying "it's not urgent" and I thought "you're calling me at 8:30 on night, either I got it or I didn't." I called him back and found out I had it, then went back and finished the show that night. It was an amazing feeling, knowing I got it and getting to be on stage doing what I love to do. I did one more West Side Story on Friday, then on Saturday I was on a plane and by Monday I was filming. That's a fast turn around. I didn't really have a chance to say goodbye to my cast, and I'd spent a year with them. It was bittersweet but an amazing reason to leave. I had been in school for two years and then I couldn't finish school because "West Side Story" happened, and now I'm on "Glee". I'm definitely not going back now, at least not for theater. I'd decided i wasn't going back after West Side, since things are going well I wanted to pursue it for a little longer. I figure a few years down the line, once I'm done paying back the student loans I already have, maybe go back for something else. It's very important for me to go back at some point and get a degree, but I don't know what I want to do yet. I want to finish this part of the journey first. What can you tell us about Sebastian? Sebastian is new to Dalton, he's a new student. He's bringing the Warblers back, which I think people are excited about. He's a gay character, obviously, but he's kind of a new type of gay character. He's someone you wouldn't necessarily know is gay unless you asked him, but he'd be the first person to tell you. He's very confident and comfortable with who he is and what he wants. Darren (Criss) was that new confident strong gay character, and Sebastian is taking that a step further. He's a guys-guy, just a dude who happens to be gay, he's a lacrosse player, he's popular. He's after Blaine, obviously, and he's also trying to take the place that Blaine had as the leader of the Warblers. He's been referred to as a villain, which I guess is true in the sense that he's going to get what he wants and he doesn't care who he steps on along the way, but he does so with a smile on his face. There's a charm you wouldn't really expect, I guess. I think that's really interesting and fun to play. I think it's an important character, It's showing a dude who happens to be gay and comfortable with it which we haven't really seen on the show. Darren's character is a gay guy, and you can see that, and I don't think you can see it as much with Sebastian. I think it's also important because it's introducing a love triangle for Blaine and Kurt. It's going to show these two aren't together because they're the only two gay characters. We don't really know yet if I'm going to split them up yet, but this is ending their honeymoon phase and making them more like the rest of the couples on the show. I think it's important to show, because it's not like there's couples and gay couples. Introducing some similar drama that everyone has seen before. Gay story lines on "Glee" have gotten attention, both positive and negative, is that something you're concerned about as an actor taking a role that will be under so much scrutiny? A little bit, but at the same time, I mean, Darren handled it so so well. I feel lucky to be following in his footsteps, to kind of refer to and to help me figure out how to handle all this. It's kind of weird though, on places like Twitter, to get hate from people who don't even know me yet. The idea of splitting up Klaine, if you well, is not sitting well with people. It's weird stepping into that and people not liking you off the bat. But at the same time I'm getting so much support and love from people I don't know, it's great as an actor to have people backing you up no matter what. Do you know how many episodes you'll be on yet? No, not at all. I've done one episode and it's kind of one at a time right now. It's not like a set mark, which is fine because it means there's not an end date on it, but also no guarantee on if I'll do more. We saw in a preview clip that you do dance in your episode, do you sing as well? I do get to sing a little bit, a featured part, but not my own song. What was it like coming to set for the first time? It was crazy, I'd never been on a TV or film set before, ever. It was my first camera experience. I didn't know what to expect, but it was so much fun. I feel so lucky to part of such a wonderful, relevant project when it's at its peak. Darren was actually very cool, he would walk me through things as they were happening, helping me figure out what everyone's job was and the lingo of a set, what type of shot was happening. I had no idea how wide a shot was or how tight a shot was, what the guy next to me was doing touching my costume between takes. Darren was really cool helping me figure out the ropes, and he wanted to be really clear he wasn't demeaning me and I as like "no, bro, I need it!" Everyone was really cool and nice to me, and they didn't need to do that! They're TV stars and I'm nobody! Darren had the same experience last year as coming into the "Glee" family did he give you any words of wisdom? Kind of, he told me nothing is going to prepare me for what's going to happen. He said, "I wish he could give you advice, but your life is going to drastically change." That's the part I haven't really wrapped my mind around yet I guess. My episode hasn't aired, no one knows who I am, no one recognizes me, I'm just me. I don't know what to expect yet I guess. Darren's great, from what I've heard from people who've known him before this all happened, that he's remained the same, and very cool. I can only hope the same for myself if I'm so lucky to blow up the way that he has. Do you have a lot of scenes with Kurt (Chris Colfer) and what's he like on set? Chris, he's really cool and talented and funny. He has all these funny little one-liners between takes that make everyone laugh. The two of them are talented guys who happen to be genuinely very nice. My first day on set was just the two of them with me. It couldn't have been made any easier. Have you met any of the other main cast? I have met everybody except for Jane Lynch, actually. The most exciting, coolest person to meet! But I'm sure I will in the near future. My last day of filming was the day they were filming "West Side Story" on stage. I got to briefly meet everybody that day. Do you feel like the end of Episode 5 leaves a lot of doors open for your character? I shouldn't say too much, but I will say that it's a pretty big character reveal. I'd be surprised if you didn't see too much more of Sebastian. But to be honest I do not know how much I'll be around. It's set up that it could go either way. And that's all I can say about it... There's some good stuff coming up, and not just in that episode. The episode before and those following. There's some juicy stuff happening. What are the Warblers actors like? My favorite day of shooting so far was we went to Dalton, in Pasadena. Those guys are so much fun, they're amazing. They welcomed me with open arms into the family. We all clicked right away, we're tweeting each other and figuring out times to hang out. We're just a bunch of guys, and what's more fun than a bunch of guys singing and dancing? Were you aiming for Broadway as a career originally, or were you open to TV? My childhood dream was always to be on Broadway. I wanted to end up in TV and film. It's kind of flipped, and I'm not mad about it, but my childhood dream is Broadway and I want to end up there. I need that Broadway debut, I did a tour but I need that debut and I am going to work to end up there. I do want to spend time in TV and film, who knows what the timeline will be, the timeline has surprised me a lot already. My favorite actor that I look up to is Joseph Gordon-Levitt. His career is something I look up to, I just want to be that guy. He's always part of projects that have a lot of soul and that's what I want to do as an actor. Do you have music ambitions in the pop route outside of Broadway? Not necessarily. I've never been passionate about just music, I've never seen myself going into music in that sense. My love for music has always been connected to the stories told through music, which is why I was drawn to theater and why I think "Glee" is so powerful. I love music, more than anything, I don't think I would want to go into a strictly music field. I'm not looking to do it, but who knows what will happens. Any dream songs to perform on "Glee"? I'd like to do something with a new vibe, but they've covered so much that's almost impossible. Some of my favorite artists are Jason Mraz, Eric Hutchinson, Ben Folds, Bruno Mars, Mumford and Sons, Maroon 5 -- their vibe is slightly different from all the pop stuff on "Glee", although some do fall into that genre. There's definitely some Mraz and Maroon 5 I'd like to do. I guess one fun song would be "Butterfly" by Jason Mraz, kind of flirtatious, something to sing at Blaine with the Warblers. What's it been like with the fan base on Twitter? How are you adjusting to the world of "Glee" fans? You tweeted your phone number. It was terrifying! I was in a Direct Message conversation with someone who was trying to give me info for a get together and they didn't have my number. So I was trying to send it to them, and somehow I put it on my live tweets. I didn't even realize I did it. I was on my phone doing something and it rang, I picked it up and they didn't say anything. Then it rang again from another number and the same thing. Then it kept ringing. Within 10 seconds 20 people had called me. I thought "what is going on?" and then I realized I had put it on twitter. Within 5 minutes I had to call AT&T and go "I need to change my number now!" My heart was going crazy like, how did I do this!? It was very extreme and very scary. Did you listen to any messages from the fans? I listened to a few out of curiosity with my roommates, we had a good laugh at my expense. I had calls from Canada or the UK, and some from like, a neighborhood over from mine. If they only knew! Have you met any fans in person? The only time fans were around was the Warbler day and nobody knew who I was. They recognized the other guys, and Darren was there, but no one noticed me. There's one picture of me floating around and my hair isn't even like that anymore. I'm sure after my episode airs I'll get noticed here and there. It's going to be weird, but that's the type of thing I haven't even wrapped my head around yet. I don't even understand, like why are you a fan of me. It's weird! Someone treated at me one time going "who is this @GrantGust guy, I don't know who this is?" And I tweeted back, "don't' worry, I wouldn't know who I was if I wasn't me either." You respond a lot, is there anything you won't respond to? I try to reply a lot, it's so nice to see such a simple gesture can make someone's day. If that can make someone's day then I'm going to do it. I don't necessarily understand it I guess, but I will reply to as many people as I can on Twitter. But personal things about my family or my home I won't answer. People asking about the show, I won't say what the songs are on Twitter. There are certain things - (Laughs) I'll put my phone number on Twitter, but that's all. Is there anything I didn't ask you? Since this is your first major interview and you're not yet bored or jaded by interviews yet, is there anything you want to share? Hmm, well actually, I was talking to my mom earlier today and she told me (mimics his mother) "the only thing I want you to say is I made you take tap against your will, and that I've always been 100 percent supportive of you." And that's true, my parents and my family in general have been amazing since day one about me going into a business where you're almost destined to fail. They've never been stage parents waiting in the wings, but they've always been supportive of me.